Mayor Garcetti signed his tenth executive directive—a mayoral executive order—calling for an end to all traffic-related deaths by 2025. 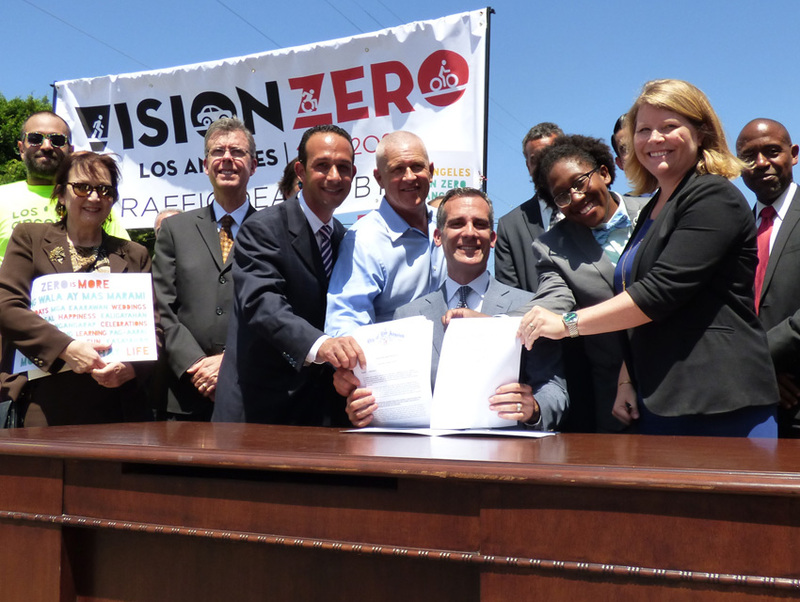 Called “Vision Zero,” the plan is a central aspect of the recently-passed Mobility Plan 2035, which lays out a more pedestrian- and bike-friendly Los Angeles through the creation of cycle infrastructure and busways. As Garcetti pointed out in his announcement today in Boyle Heights, walkers and cyclists comprise 44 percent of traffic-related deaths in the city. Another scary statistic was trotted out by Councilman Mitch Englander: nearly half of all traffic collisions in the city are hit-and-runs. So what’s the plan for getting to zero? Garcetti’s first step was ordering city departments to report back with ideas by December 1; specifically ideas that can be implemented immediately and reduce traffic-related deaths by 20 percent by 2017. There will also be a Vision Zero Task Force and a steering committee to make sure fixes are actually put in place. The plan is to utilize data—like targeting areas prone to accidents—to get a handle on the deaths (about 200 people die each year in the city due to traffic accidents). Other cities, including New York, Chicago, and San Francisco, have already adopted Vision Zero. Previous articleDid You Spot These L.A. Locations in Fear The Walking Dead?